As expected, the UFC will be taking its talents back to Brazil on January 19th. 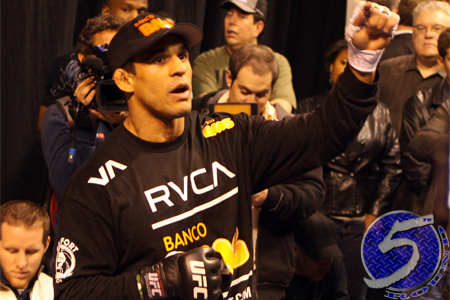 However, it wasn’t known until Saturday morning that a middleweight shootout between Vitor Belfort (Pictured) and Michael Bisping would headline the fiesta. In addition, it appears the event will be of the free variety and air on either FX or FUEL TV in North America. The UFC is still trying to secure a venue to host the show. Earlier this week, Belfort acknowledged there was some weight behind the rumors of a tango with Bisping, but stated on Twitter that nothing had been signed. “The Phenom” is coming off a submission loss to reigning light heavyweight champ Jon Jones at UFC 152 in Toronto. The defeat marked just the second in nine fights for the veteran, with the other L in his current run coming against middleweight king Anderson Silva at UFC 126. Bisping, meanwhile, has been campaigning for a shot at Silva’s crown, though a vicious finish over Belfort could earn him the nod. “The Count” posted a unanimous decision win over Brian Stann at UFC 152 to get back in the win column. He had dropped a close decision loss to Chael Sonnen in the bout prior. Welterweights C.B. Dollaway and Daniel Sarafian will serve as the night’s co-featured attraction.